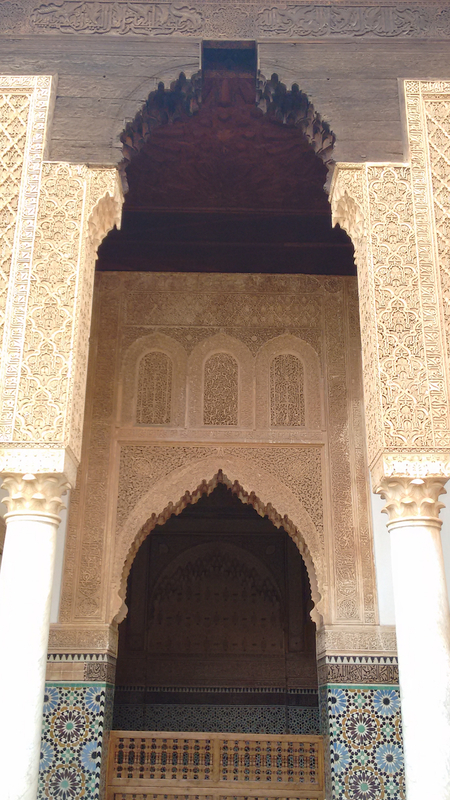 My Portugal flights included a stopover in Casablanca in both directions. Since it cost barely $50 more to hop out in Morocco before continuing on to Dakar, I decided to stay a few days. 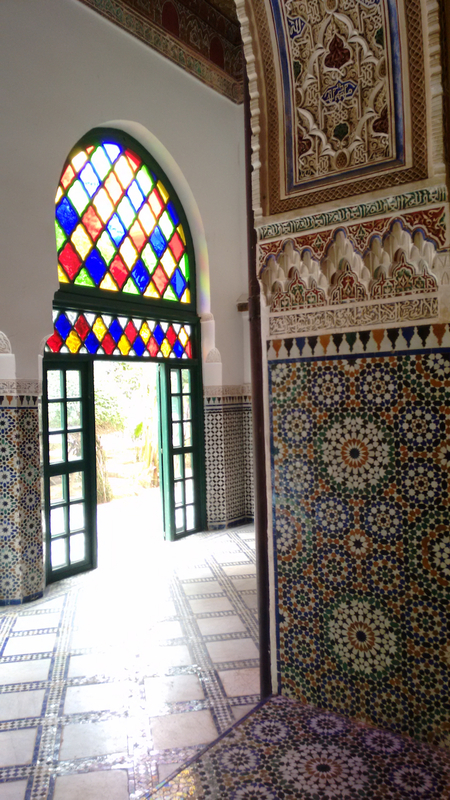 After an uneventful evening in Casablanca, I took a morning train from the Casa Voyageurs station to Marrakech, a little over 3 hours away. It was remarkably easy and the train runs every couple of hours. 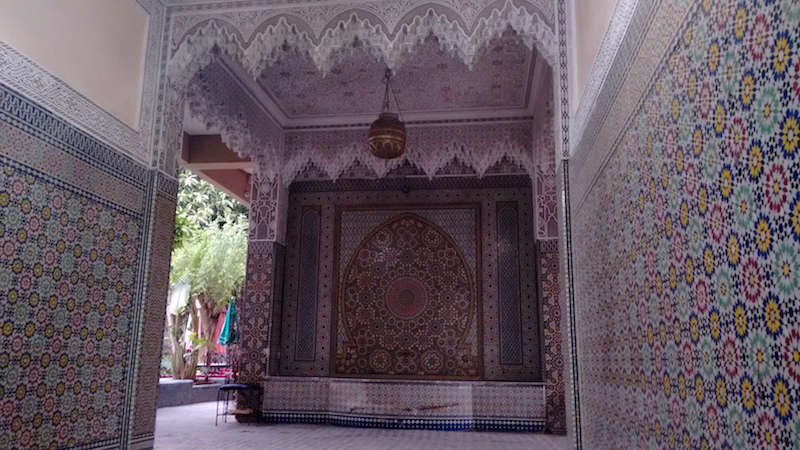 My hotel, Riad Dar One, was just outside the medina walls. 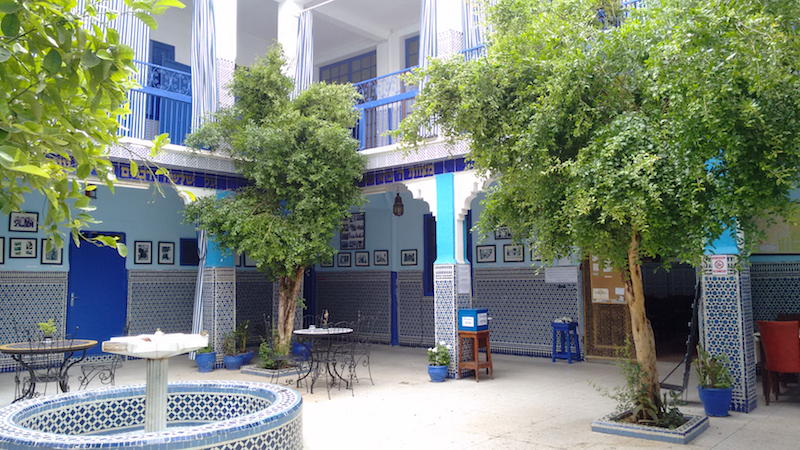 Jenny had stayed there on her honeymoon and loved it, and since I was in no mood to bargain hunt while solo for four days in Morocco, I booked it without looking into anything else. 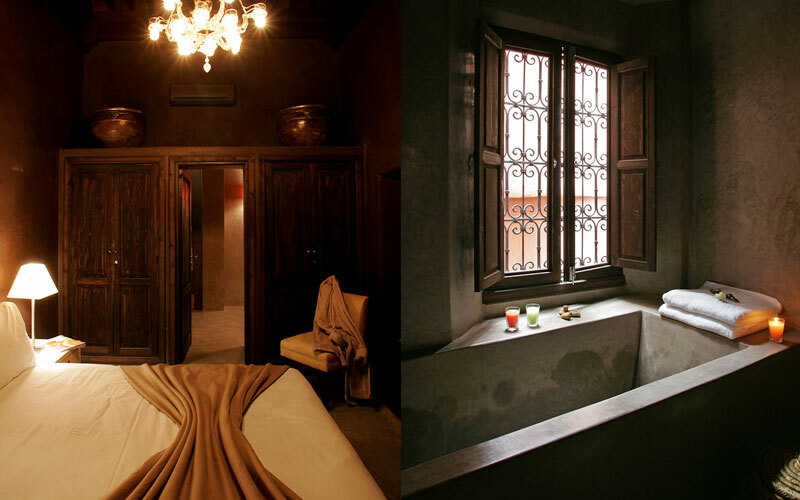 I’m so glad I did because the spa-like atmosphere – roses floating in water features, a capacious concrete soaking tub, a terrycloth robe even better than the one in Amares – helped me to repress my growing anxiety about the very challenging job I would be starting not one day after this vacation’s end. Before enjoying the opulence of the hotel, I dive-bombed the city. 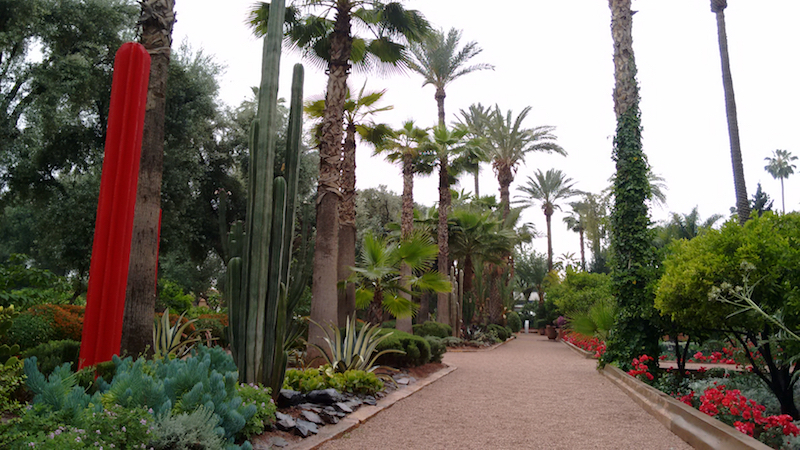 It began with a frenzied walking tour of a few spots that were all closing within a couple of hours. I didn’t feel like seeing any of them for more than ten minutes anyway, but I couldn’t skip them entirely because I am prone to tourist-based FOMO. So I became that person who zips through places just to cross them off the list. Sometimes you just have to let you do you, even when you are annoying even to yourself. 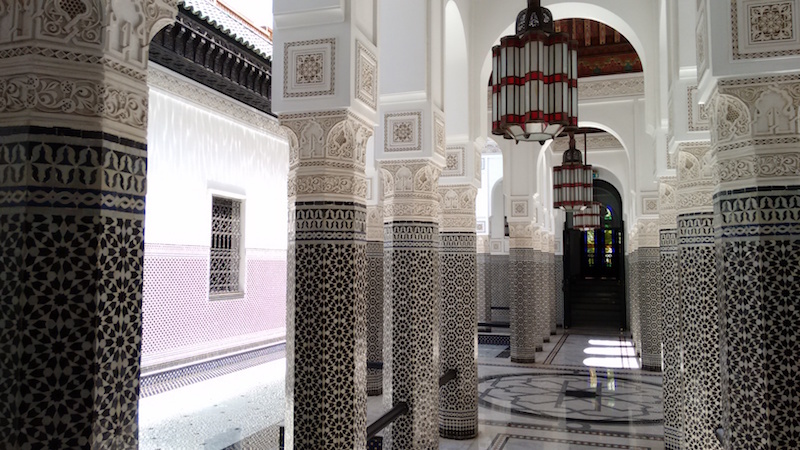 The Palais de la Bahia was ornate and pretty but neither old nor over-the-top enough to really wow me. Now that I’m looking back through the pictures though, I’m thinking this is actually pretty over-the-top. I didn’t even know the significance of the Palais El Badii ruins when I visited, and I’m only now reading that they are the remains of a 16th century palace. Having completed my whirlwind tour in the nick of time, I slowed down the pace and headed to Jemaa El-Fna Square, which was sort of like 1,001 Arabian Nights come to life. All previous evidence to the contrary, I am actually quite into historical sites… but only when I can form a picture in my mind of a human being from that time inhabiting the space. 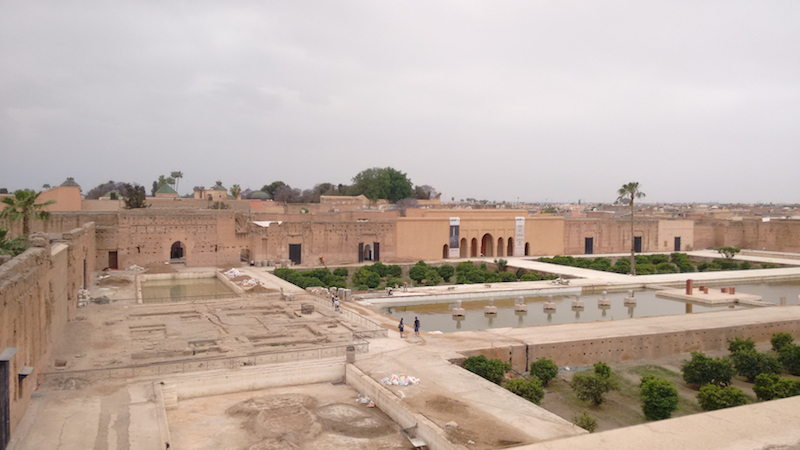 This was easy to do in the square, because I had read that the snake charmers, cross-dressing belly-dancers, and monkey trainers performing there had been plying their trade in this way for almost a thousand years. Aside from the soccer jersey adorning the monkey, everyone looked exactly how I’d expect them to have looked in, say, 1286. That really captured my imagination. 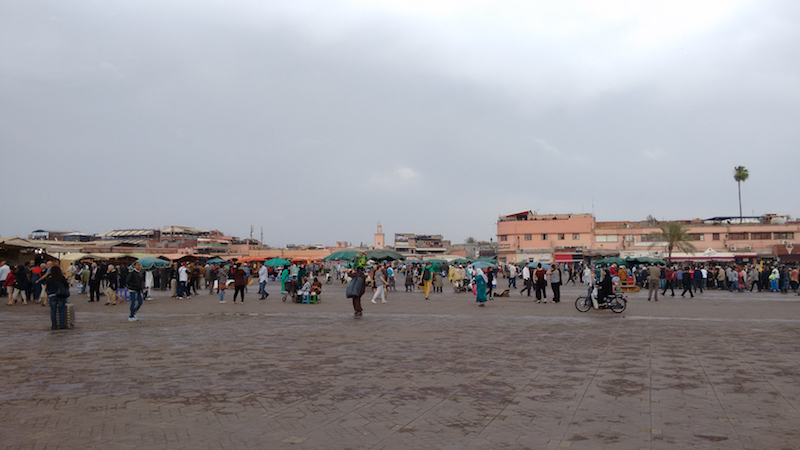 I meandered through the square and as evening fell, I wandered into the souks, where all sense of direction goes to die. I waited to take the photo above until I was in a place and moment of relative calm, but 99% of the souks were chaos, confusion, curves, and crowds. I consider it a small miracle that I eventually – very eventually – found my way to a restaurant I had read about in the hotel’s guide. 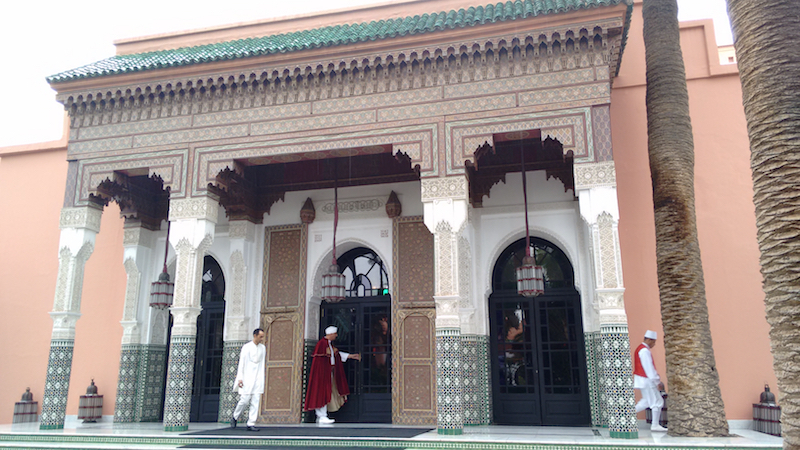 (It was the very chic but not very expensive Le Foundouk. Its atmosphere and layout reminded me of that restaurant in Kill Bill where Lucy Liu and Uma Thurman battled.) 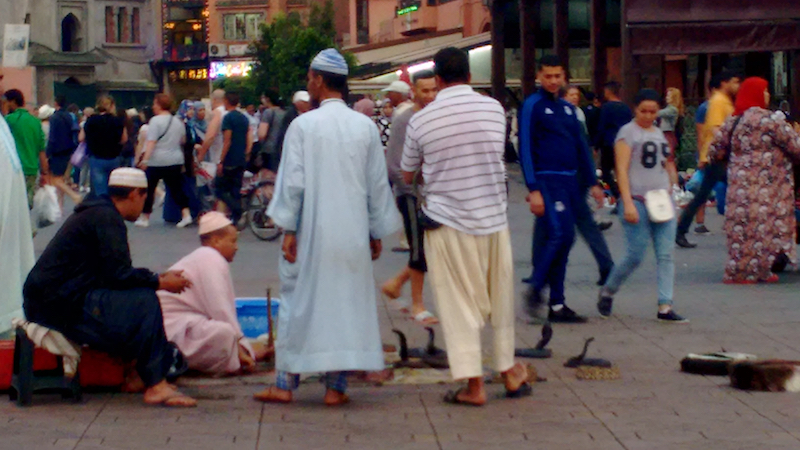 After dinner I thought about walking back to the square to hang out with the snake charmers, but I ended up scrapping that plan and taking a taxi back to the hotel. Even though everything in the medina is really close together, the alleys in the souks were more confounding than a corn maze and I wasn’t about to try my luck with it at night. Instead, I continued the geriatric theme from Portugal and made an activity of taking a bath, my first in at least ten years. It was amazing. I stole this picture from the hotel’s website to help you understand. The next morning I had breakfast on the hotel roof, where I was shocked by the gray skies and wet surfaces. 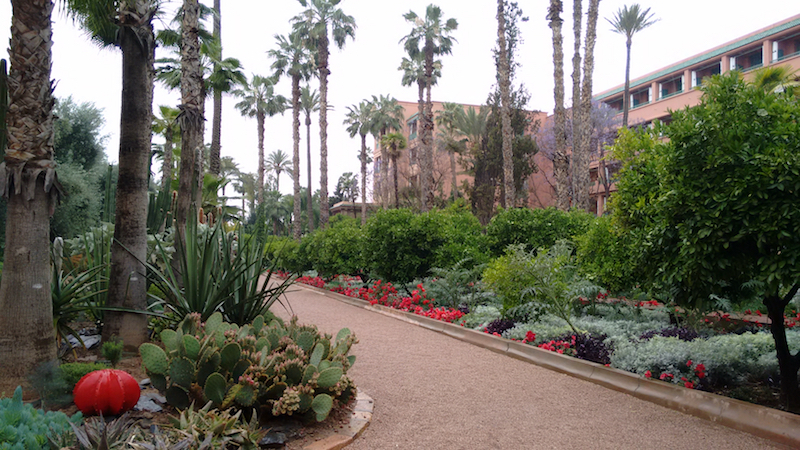 It hasn’t so much as drizzled the entire time I’ve been in Senegal, and I assumed Morocco would be the same. 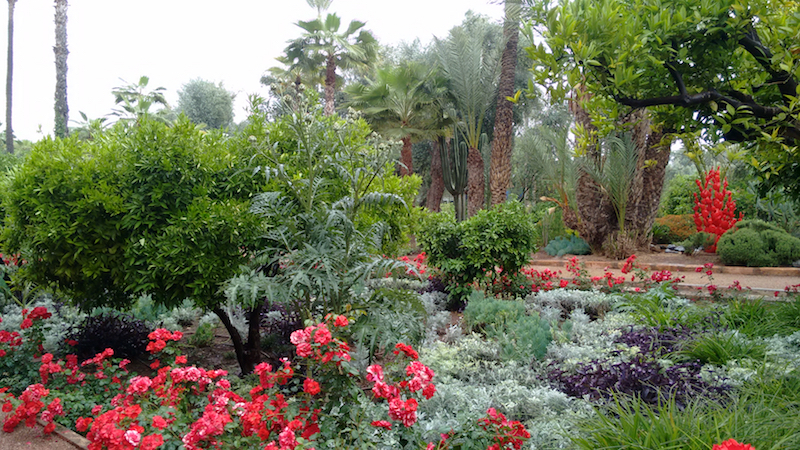 I guess they have entirely different seasons, because that day I got stuck in two epic hailstorms, which added to the Marrakech mystique. 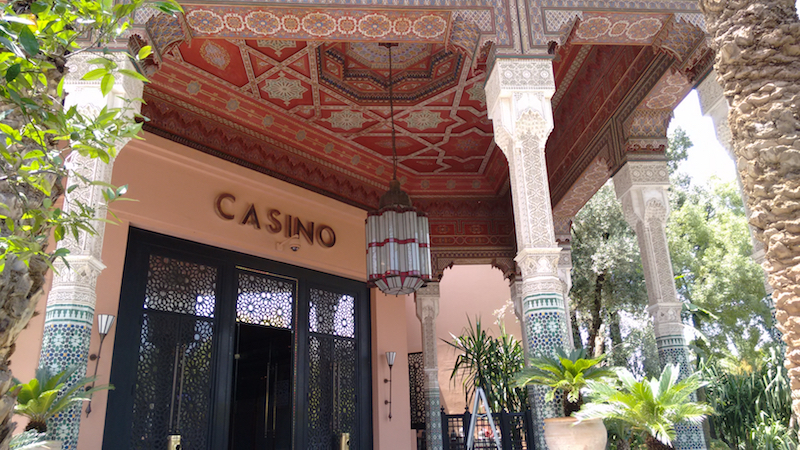 ….and on to La Mamounia hotel, where the garden cafe had been recommended by our Lisbon AirBnB host (he was full of very useful recommendations both near and far). The hotel was stunning. 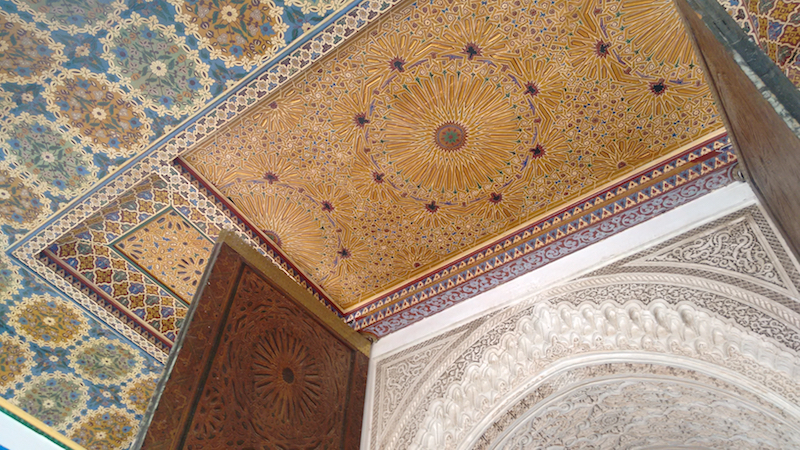 So stunning, in fact, that I wandered up and down the hallways of each floor trying to make sure that I saw every last bit of splendor. In the midst of doing so, I inadvertently walked deep into someone’s suite, stood around for awhile admiring the view, and only realized my mistake after I spotted the bathroom and wondered why it looked so private and personal. In my rush out the door, I ran into a hotel employee and started stammering in even-more-broken-than-usual French about how I thought it was a lounge. Thankfully he did not have me kicked out of the hotel, and I found my way back downstairs to a real lounge, where I waited out the storm in luxe surroundings that begged the question: How is someone like me allowed to hang out here? Towards the back of the garden there was a teahouse that I had all to myself, where I ate macaroons and had my morning espresso while watching the skies turn from gray and dismal to the brightest blue. 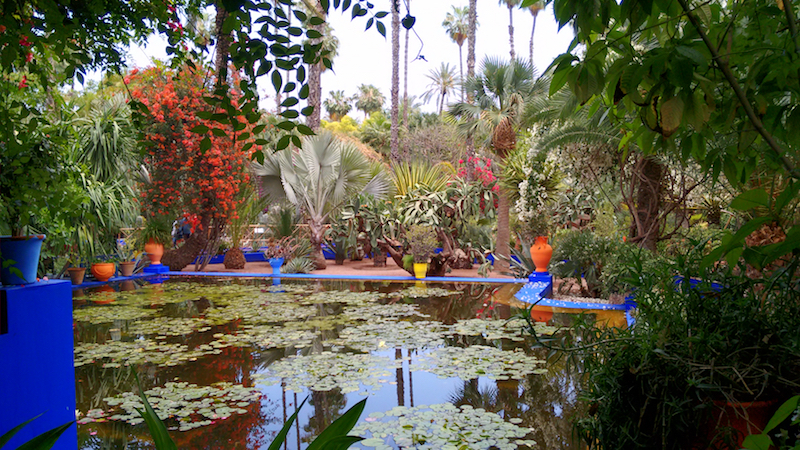 Luckily, the clear skies lasted through my visit to another famous garden fifteen minutes’ walk away, Jardin Majorelle, which was originally owned by an artist and then rehabilitated years later by Yves Saint Laurent. 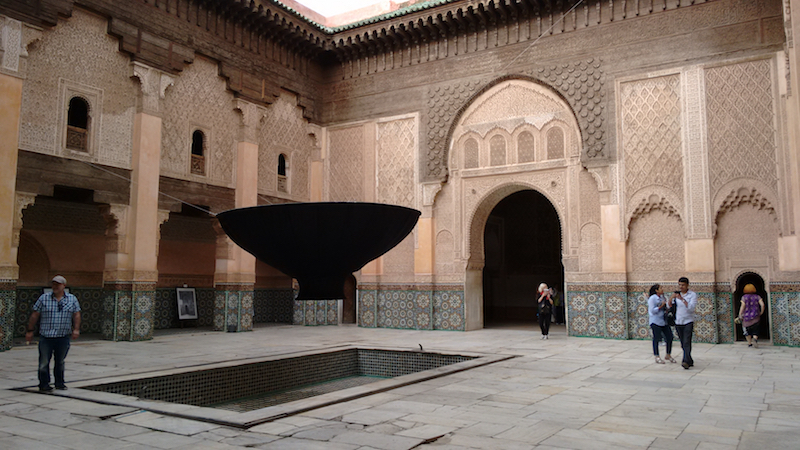 Then it was back to the medina. 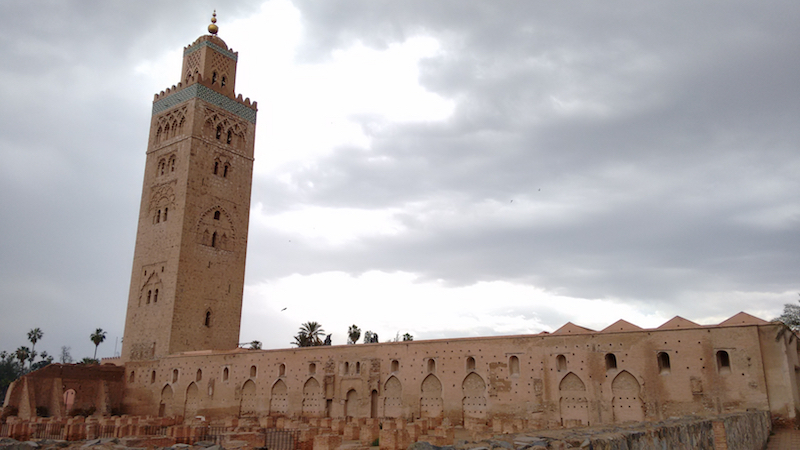 The first hailstorm started while I was visiting the Ali ben Youssef Medersa, a hundreds of years old religious school for boys. Everyone went running for cover as these golf-ball sized chunks of ice came pounding down. It felt appropriately biblical. I know this must have been said eight million times before, but all I kept thinking was: Moor is definitely more. I left the school and headed back into the souks to do some shopping. Two things to know: for about a decade, I have made a tradition of coming home with one special thing from every new country I visit. But for twice that long, I have wanted to go to Marrakech primarily in order to buy one of every single thing they make. 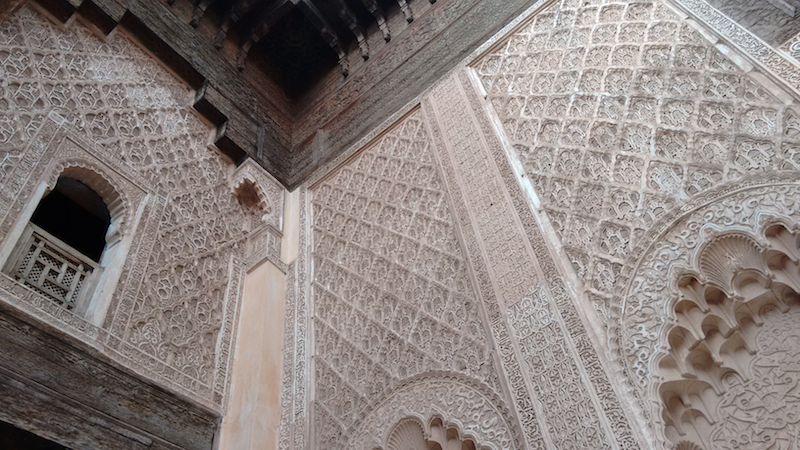 My current situation of living out of a backpack with no permanent home makes the latter unfeasible, but in any case I realized in Marrakech that I’m not as enthused about leather poufs and vintage carpets as I used to be. In fact, I was hard pressed to find even one item that spoke to me strongly enough to warrant lugging it back to Dakar. So what did I end up buying, in desperation, just so I would not leave empty-handed? More f*#%ing soap. 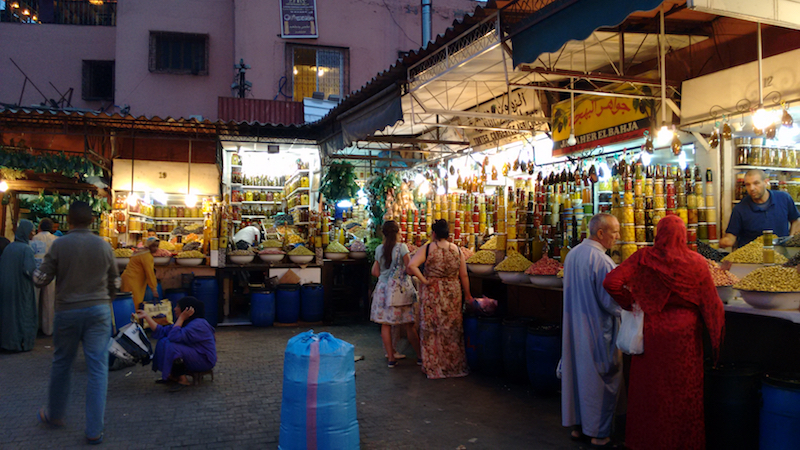 On the one hand, they are traditional and delightful Moroccan scents and they support a women’s cooperative. 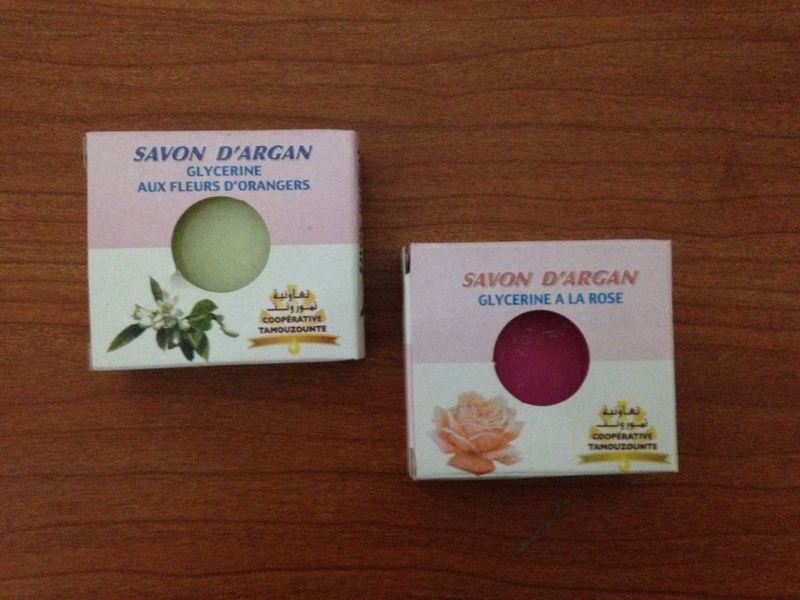 On the other, this was the second country in a row in which soap was my only souvenir. Souvenir means “to remember.” How I will remember a place forever with an item that by design disappears two weeks after you start using it, I cannot say. 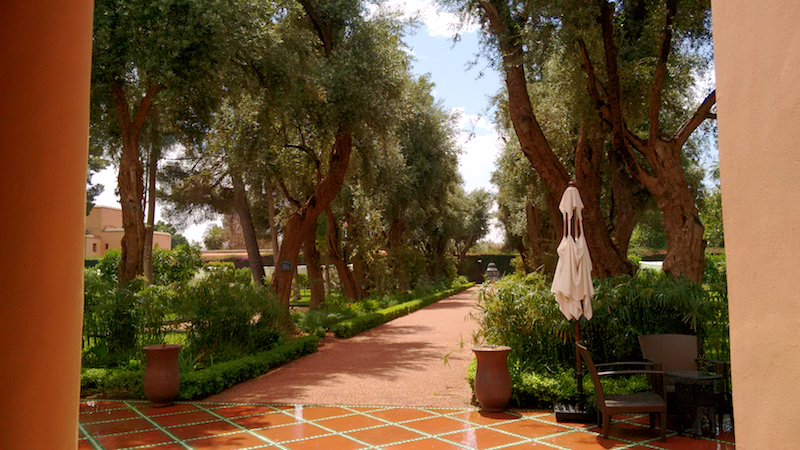 Another nice dinner, another nice stroll, another nice bath, and that was basically it for Marrakech. Before catching the train the next morning, I did stop in to a circa 1492 synagogue three blocks away (3 blocks in theory; more like 20 with all the wandering around in circles). 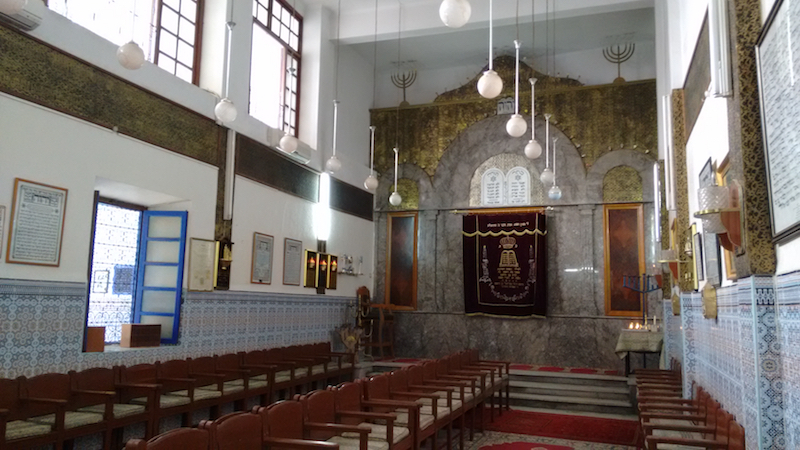 I think it’s still in use, though the Jewish community in Marrakech now only numbers in the hundreds. 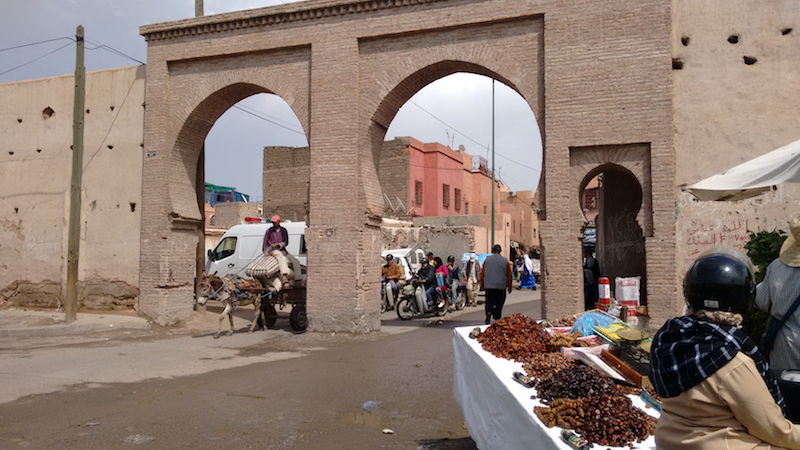 Getting lost on the way to the synagogue made me late for my train back to Casablanca, and so I departed Marrakech much as I had entered it: in a rush. 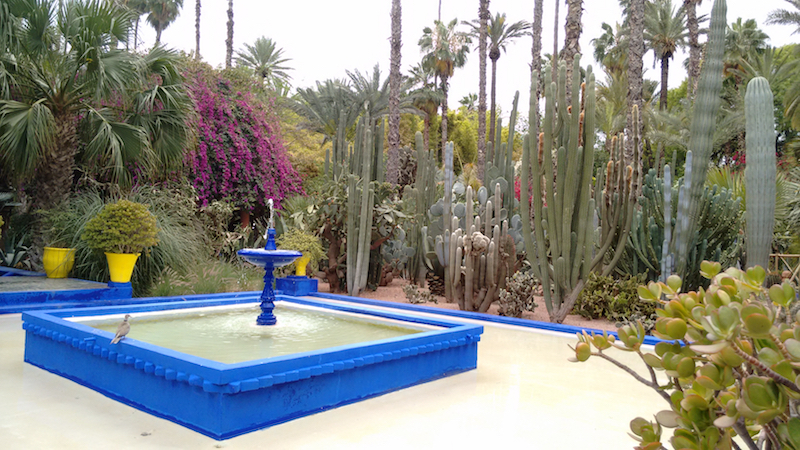 I wish I could say I chilled out once I got to Casablanca, but that would not be the case.